The contributions to this collection focus on the intersecting dynamics of gender, generation and class in Southeast Asian rural communities engaging with expanding capitalist relations, whether in the form of large-scale corporate land acquisition or other forms of penetration of commodity economy. Gender, and especially generation, are relatively neglected dimensions in the literature on agrarian and environmental transformations in Southeast Asia. 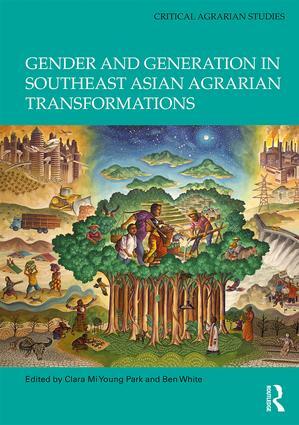 Drawing on key concepts in gender studies, youth studies and agrarian studies, the chapters mark a significant step towards a gendered and ‘generationed’ analysis of capitalist expansion in rural Southeast Asia, in particular from a political ecology perspective. The collection highlights the importance of bringing gender and generation, in their interaction with class dynamics, more squarely into agrarian and environmental transformation studies. This is key to understanding the implications of capitalist expansion for social relations of power and justice, and the potential of these relations to shape the outcomes for different women and men, younger and older, in rural society. The chapters in this book were originally published in a special issue of The Journal of Peasant Studies. Clara Mi Young Park is a PhD candidate at the International Institute of Social Studies in The Hague, Netherlands. Her current research focuses on the gendered and ‘generationed’ political economy of climate change and resource grabbing in Myanmar and Cambodia. Clara is the regional Gender Rural and Social Development Officer with the Asia Pacific Regional Office of the Food and Agriculture Organization of the United Nations in Bangkok. Ben White is Emeritus Professor of Rural Sociology at the International Institute of Social Studies, The Hague, Netherlands. His research and teaching has focused on processes of agrarian change and the anthropology and history of childhood and youth, especially in Indonesia. He is a founder member of the Land Deal Politics Initiative (www.iss.nl/ldpi), and the Emancipatory Rural Politics Initiative (www.iss.nl/erpi).